Some birds appreciate a daily misting / being lightly sprayed with room-temperature water, while others prefer to bathe in a shallow dish of water. A combination of both is great -- provided your parrot is amenable to both. A good number of parrots don't like mistings / spraying. 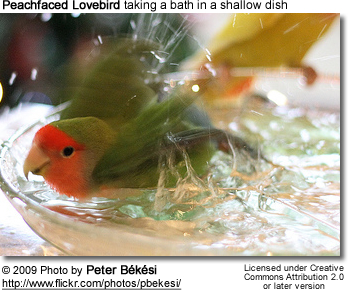 Providing a shallow bathing dish every day enables birds to bathe as they feel the need and desire to. Offer cool or room-temperature water for your pets to bathe in, as it improves their feather condition and other multiple benefits (please refer to below). Warm water, on the other hand, will strip essential oils from the feathers, and will encourage itching and picking, rather than preening. Bathing is an important part of the general grooming process. It allows birds to keep their plumage in good condition. Bathing softens dirt on the feathers and skin and encourages preening. If you bathe your parrot regularly, you will notice that his feathers will begin to become waterproof due to his preening duties. Bathing will help keep the dander down in the environment. One has to remember that in the confinement of our homes, pollutants will collect in much greater density than they ever would in the wild. Especially in small, poorly ventilated spaces pollutants - such as dander, dried droppings and skin/feather mites - can be a major issue. Note: daily ventilation (opening windows and doors) is the best and cheapest way to get fresh air into your home. If that is not possible -- an air filtration system should be considered for those who are concerned about their pets as well as their own health. 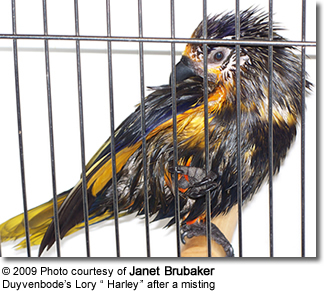 Bathing in room-temperature water provides a natural venue for moisturizing a bird's skin. Skin can become dry and itchy, leading to plucking. It's also important that any pollutants be removed from the bird's feathers so that it doesn't ingest any toxic stuff while preening. Bathing is especially important during molting when birds sometimes feel itchy and uncomfortable as the new pin feathers break through the skin. Keeping the skin and feathers hydrated is helpful and Aloe Vera spray from distilled aloe without additives helps to hydrate skin and feathers and prevent itching. A daily soaking bath is helpful along with spritzes of water or aloe spray between baths. It is easier to see new pin feathers emerging if you first wet down the feathers so check for new feather growth is after a soaking bath. Leading aviculturists have speculated that more frequent bathing can even benefit the respiratory systems of some tropical bird species. Bathing is also important for breeding birds, as it helps them regulate the humidity level in the nesting box, which is important for the development of the chicks inside the eggs. Misting: In warm weather, or when you can provide enough warmth after a bath, you can mist your parrot with a handheld spray bottle that you can buy in any drugstore or supermarket. If he's interested in the bath, he'll spread his wings, put his head down, shake around, and delight in every drop. Try misting above the bird so that the water simulates a rain shower. You can do this outside (in a safe place) with a hose for larger, ardent bathers. Taking a Shower: Parrots are naturally social creatures and enjoy taking a shower with their owners. There are even various avian shower products available such as special shower perches and sprayers. If you choose to introduce your pet to the shower, it's best to do so with extreme patience at first. Allow your bird to watch you in the shower before attempting to convince him to join you. He should decide on his own that the shower is a friendly thing, and poses no threat to his safety. If your bird likes to shower with you, you may want to get a "shower filter". Bird's have very efficient respiratory systems and are sensitive to the chemicals that are commonly found in your water. Most of our tap water is chlorinated and fluoridated, and both chemicals are drying to skin and hair, and contribute to respiratory problems in both humans and pets. But shower filters are relatively inexpensive and very easy to install. These filters remove most of the chemicals in the water, allowing us to breathe easy and helping to preserve moisture in our skin and hair - generally contributes to a healthy home environment. These shower filters are usually inexpensive and easy to install and well worth the cost and effort. Planter Saucer: A planter saucer works very well and is readily accepted by birds for taking a bath in. They may not use it EVERY day and may initially mainly use it for drinking from rather than bathing, but chances are good to excellent that eventually they will feel like jumping in and "getting wet.". It's fun to watch -- so have the video camera ready! The Sink: My birds love the sound of running water and whenever I turn the faucet on, my lovebird comes for a shower. I make sure the area is clean and place the faucet to drip - and off my parrot is for his daily shower. Make sure the water temperature is mildly warm. If your bird likes to take his or her daily bath this way, you should invest in a faucet filter. They are inexpensive and well worth it, turning chlorinated into drinkable. Spraying: Never spray a bird that's freaked out by it. This bird will need to come to bathing on her own. Allow her to be near a stream of water (in the shower on a shower perch) and enter the water by herself. Never force the issue. Drying your Bird: Don't blow-dry your parrot. Some blow-dryers contain nonstick coating on the heating coils, which can be deadly to your bird. A bird lamp will help dry your bird. However, my birds dry by themselves and take advantage of a thorough preening session. Make sure that your bird doesn't get chilled. My birds are out most of the day and regulate their own heat. If they feel cold, they may choose to sit by the window to enjoy the sun or retreat away from the window if they get too hot. If this is not possible in your household, place the cage near the window; allow sun exposure on one side of the cage and cover the other half with a towel. The Reluctant Bather: Birds that are not used to bathing may need to be enticed. Running water often helps, or placing a flat plastic or ceramic dish filled with wet spinach, watercress, curly kale, or other greens is a way to encourage bathing. Don't give up -- you may have to repeat this several days or maybe even weeks before your bird shows any interest in it -- but most will, sooner or later. Soap: Don't ever use soap on your bird unless it's for a very good reason — for example, if he gets oil on his feathers. If soap is necessary, make sure to use very mild glycerin soap, and rinse your bird thoroughly. Wash only his body (not the face), and don't scrub. Your best bet is to fill a plastic tub with warm soapy water about chest-deep to your bird and set him in it, if he or she will tolerate that. Remembert to be gentle and compassionate, and realize that your bird may become frightened. When in doubt call your avian veterinarian. (Please refer to article on the negative effects of anti-bacterial soaps / Green and Healthy Website - also note: antibacterial soap is TOXIC to birds. Do not use in on the birds, not even on their cages, dishes or toys.) The original Dawn or mild glycerin soaps are recommended. 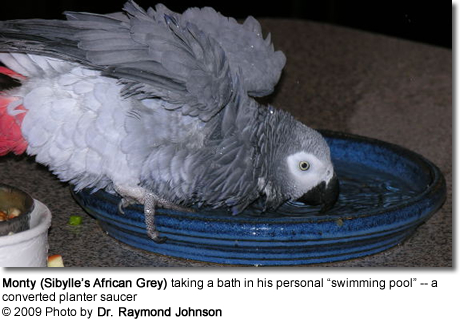 When and how often to bathe: In the summer, you can completely soak your parrot to the skin a couple of times a week. This is very good for your bird. In very cool weather, keep bathing to a minimum unless you can offer heat after the bath. Bathe only in the daytime hours — a bird that goes to bed wet can catch a chill and will be uncomfortable. If a bird gets wet and is cold, a bird lamp will help dry his or her plumage. Bathing Products: There are bathing products that you can buy in your local pet shop that contain ingredients such as aloe that are good for the skin (very recommended for feather pluckers. The simplest approach to bathing your bird to use plain, tepid, clean, filtered water.